In her most powerful novel yet, Newbery Honor author Ann M. Martin tells the story of girl with mental/emotional challenges and the dog she loves. 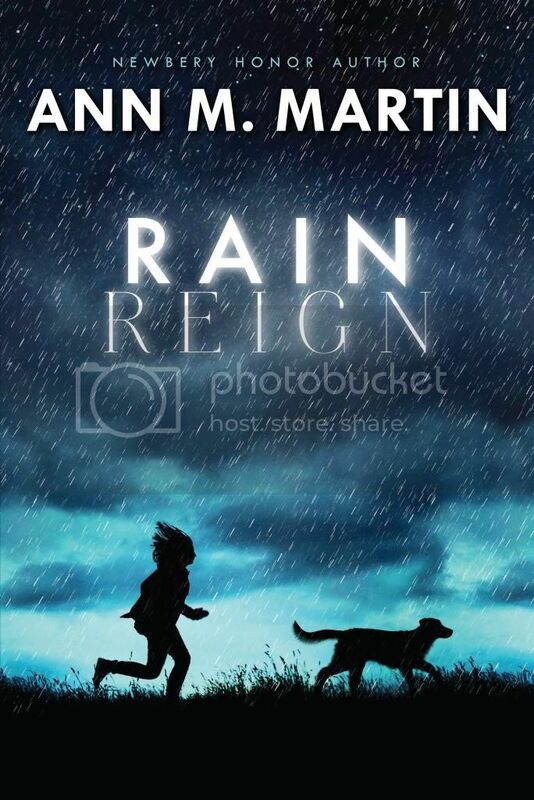 I was pretty excited to read Ann M. Martin’s Rain Reign. Martin’s The Baby-sitters Club books were a huge part of my childhood, I adored those books, but I hadn’t read anything by her since. I’m glad to have now changed that. I adored this book SO much. Rose is such an amazing, complex character. She has Aspergers syndrome, as well as an obsession with homonyms and prime numbers. She explains all of this to us as we read the story, which is from her point of view. The relationship that Rose has with her dog Rain, who her father brought home one rainy night, is more than your average child/pet relationship. They have this really amazing bond that goes above and beyond a normal friendship, and I loved this bond so, so much. Rose’s father was a difficult man to like. Unfortunately he was not a patient person, and you have to have patience and understanding when you have a special needs child. That doesn’t mean that he didn’t love her in his own way, and wanted to do good for her at times. He just came across as very unlikeable for me. Luckily she had her uncle, Weldon, who was amazing with her and I am so glad that Rose had such a wonderful person in her life. Having a niece with Autism and a nephew with Aspergers, I feel that I am pretty knowledgeable on the disability. I was curious to see how Martin’s character would be written. She definitely did her homework, or has previous experience/knowledge on the subject, because she hit the nail on the head with this character. So many of Rose’s characteristics were familiar to me, and I love that Martin wasn’t just writing how she thought a character would be, this character was spot on for Aspergers. I loved the storyline for this book. It talks about a wide variety of things beside autism, including bullying, parental frustrations, love, loss and so much more. I discovered the hard way that this is not a book that you will want to read in public. The last few chapters had me in tears while I was waiting for my daughter’s gymnastic class to end, and I had to stop reading the book a few times to take a breath and calm down. I love seeing more and more books come out that have characters with autism. There are still SO many people in the world that are uninformed and do not understand this disability. This is one great way to get information out and inform people. Overall; Rain Reign has won a spot on my Top Ten Favorite Books of 2014 list. And it totally deserves to be on that list. I loved this book so much. You must add it to your to-read list, and read it as soon as possible! I had no idea that she had a new book out. Just added it to my wishlist. I was a big BSC fan too. Loved your review!